I know there has been an ongoing flap-doodle in a recently locked thread as to what such a tree might be called. I'm not posting these pictures for that reason, because I don't care what name people want to refer to it by. I call it the Johnston Pool Beech because that's how it's known around here. That is a container it's in. It's a planter with a bottom, so there's a finite amount of space in which the roots can grow. Several times over the years I have root-pruned this tree with a spade. I tend to think of it as a sculpted landscape tree, and not a bonsai, but much of the work I do on it is similar to what I would do with a bonsai. It was time for it's mid-summer pruning, but I also wanted it to look trim because some people I've never met are going to get married in front of it tomorrow. It's going to be the backdrop in a lot of photographs, so it needs to look it's best! Lemmee know when you need a pot made for that! Nice tree, interesting pot. Where on earth did you find such a large humidity tray? Such devotion with a nice tree to show for it. Now, it's driving me crazy. 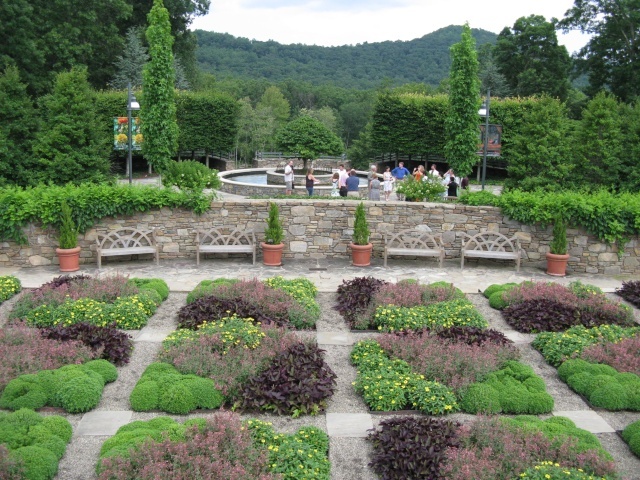 The 'hoop-top' wire border. Are you going to put rabbits in there for the wedding or do you have a duck problem? Dale, Cliff, Gary; thanks for your replies. 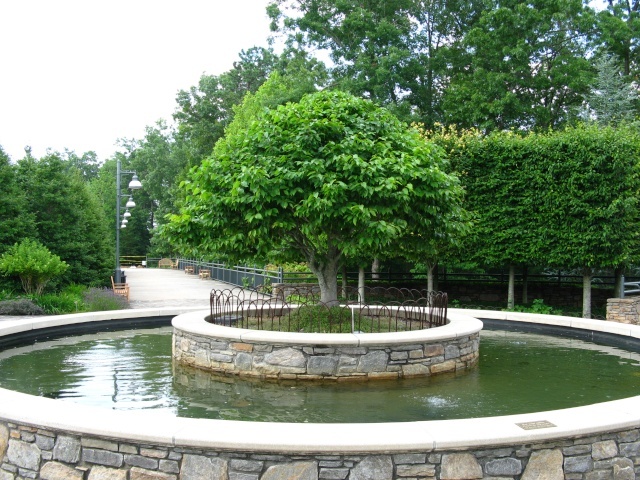 The moat-like water feature around the planter does make it a challenge to prune this tree in the summer. Having a telescopic pole-pruner is pretty much a necessity. 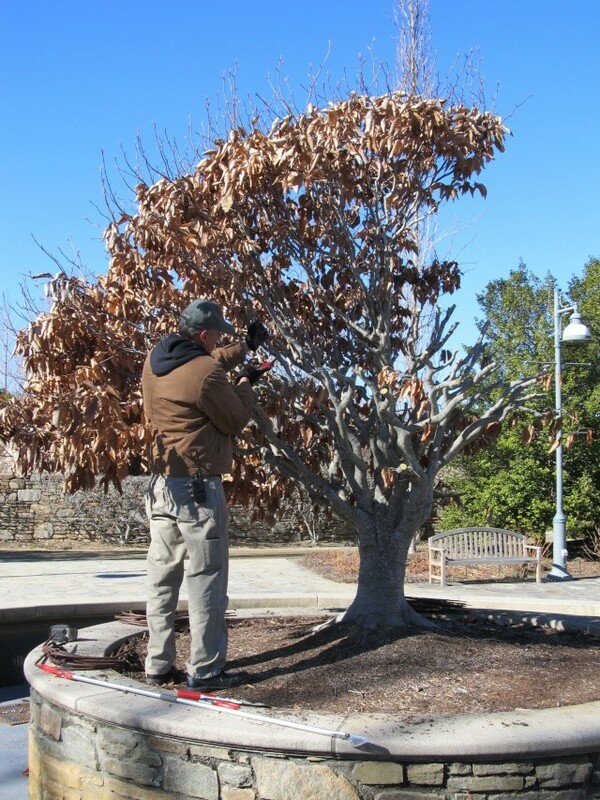 In the late winter, however, when I do the main structural pruning, the water is drained and it's easier to step back to have a look. I think the water feature does act like a big humidity tray, helping this tree to stand out in full sun all day in the summer without getting stressed. The wicket fence around the tree is there because, like everything else at the Arboretum, this planting is in a public space. Once, before the fence was installed, I came by one afternoon to find a couple that had waded across the moat, climbed up into the planter and spread a blanket under the tree so as to have a picnic. This hardly seems credible as I write it, but when dealing with the general public, all things are possible. 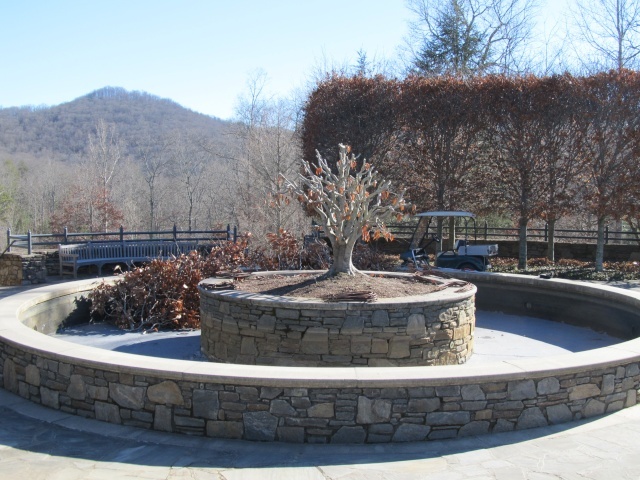 To either side of the water feature you may notice an aerial hedge, which also is made of American Beech. 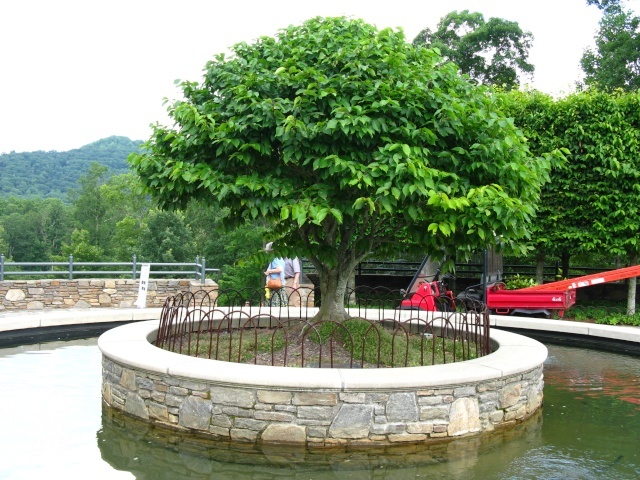 The whole area is very formal and highly geometric, and there in the middle of it is this bonsai-like sculpted tree, a veritable island of naturalism. Do you have any pictures of it without leaves, or are they persistent through winter? Velodog - Unfortunately, I don't have a picture of the Johnston Pool Beech in winter time. I don't know why that is, but I'll need to address it this coming winter. 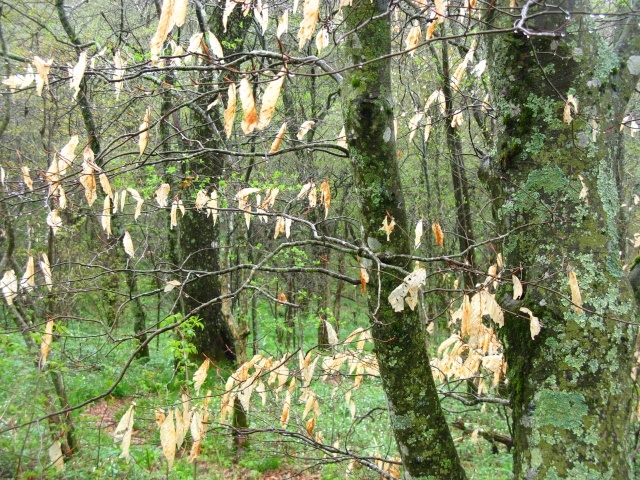 Yes, the leaves are persistent, falling off just before the new foliage emerges in the spring. It would be good to have an image of the bare tree so the branch structure could be seen, but the window to get such a shot is pretty small. 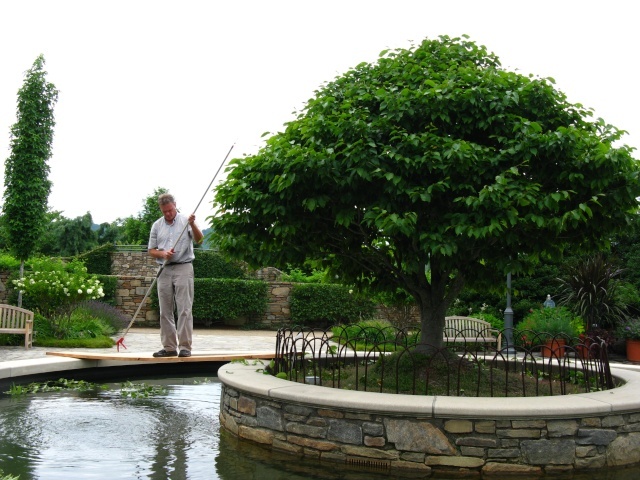 [quote="AJ"]Dale, Cliff, Gary; The wicket fence around the tree is there because, like everything else at the Arboretum, this planting is in a public space. Once, before the fence was installed, I came by one afternoon to find a couple that had waded across the moat, climbed up into the planter and spread a blanket under the tree so as to have a picnic. This hardly seems credible as I write it, but when dealing with the general public, all things are possible. Now that is too funny. From ducks to pinicers. "I came by one afternoon to find a couple that had waded across the moat, climbed up into the planter and spread a blanket under the tree so as to have a picnic..."
You're probably lucky that's all they were doing! Such a very nice bonsai...er...tree, you have there. Bonsai? Or not bonsai? Does the size really matter? It seems that in Japan they have several centuries old bonsai, at the Emperor's Palace, that are pushing 10 feet tall, and since 10 feet exceeds the then "formal" definition of the height limit of a bonsai, and since they wanted to keep these "centuries" old bonsai in the Emperor's Garden, they decided to create a new bonsai size group...thus, the Emperor's Size...up to 10 feet. Hark! Do I hear a VOX CLAMANTIS IN DESERTO crying "...but, but, but, it's tooo tall...!". Well, to those purests out there, it looks as though it wouldn't be a major trimming exercise to bring the apex back to within the 10 foot limit. The beech was gone this year I believe. did it die or was it moved somewhere else? bucknbonsai wrote: The beech was gone this year I believe. did it die or was it moved somewhere else? Check Arthur's thread Alex...it was moved in favor of some kind of statue donation. AJ is going to make a bonsai from it.... Took a crane to move the 5000lb root ball. It really is a beautiful tree! 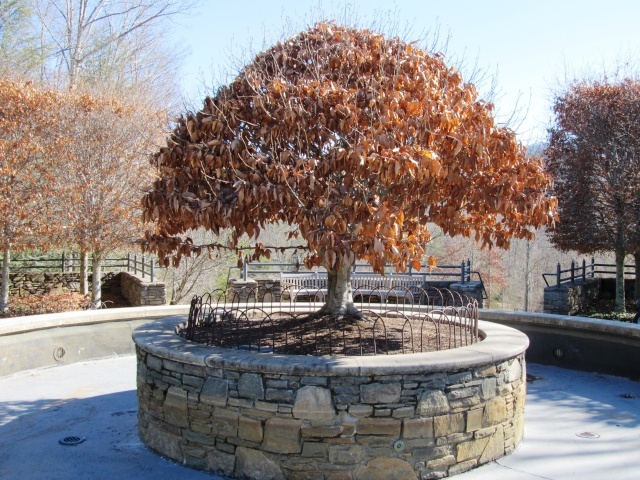 I love the american beech, whether people call it a bonsai or a niwaki, it's awesome! Alex - Somehow I missed your post on this thread last week, and I apologize for not responding. Thank you to John G. for answering in my absence. 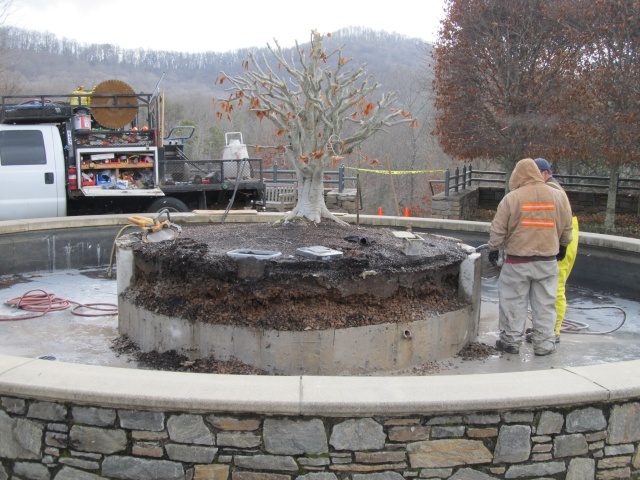 Unfortunately, what John reported is true and the beech formally known as The Johnston Pool Beech is no longer to be found in the the Johnston Pool, which is now in the process of being turned into a fountain. 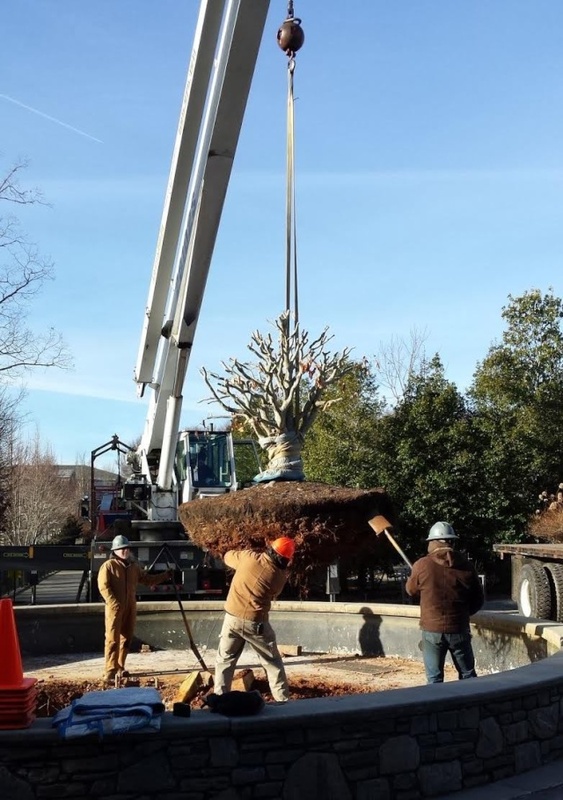 The fountain is part of a new display that will feature a statue of Frederick Law Olmsted, who is often referred to as "The Father of American Landscape Architecture". 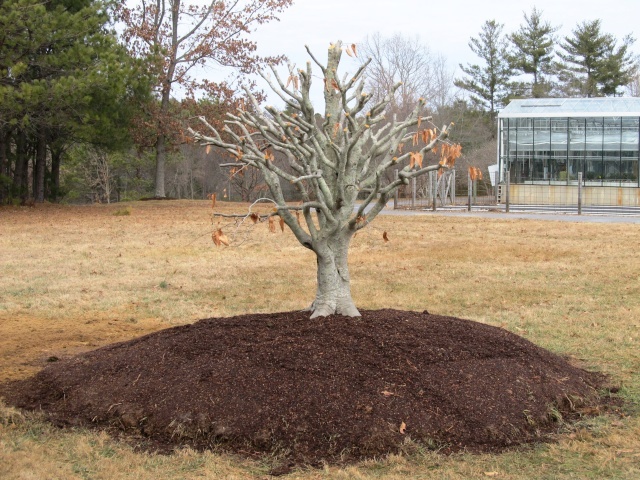 The beech was cut back before being successfully transplanted to a temporary growing area. 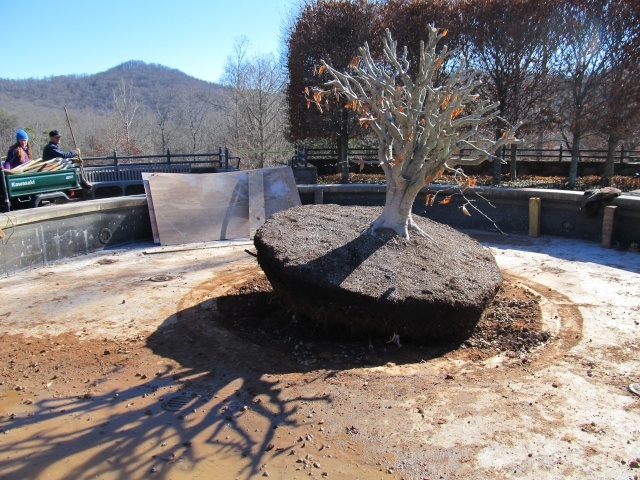 Ultimately it will become an "official" bonsai, to be displayed in the Bonsai Exhibition Garden in a custom-made pot. 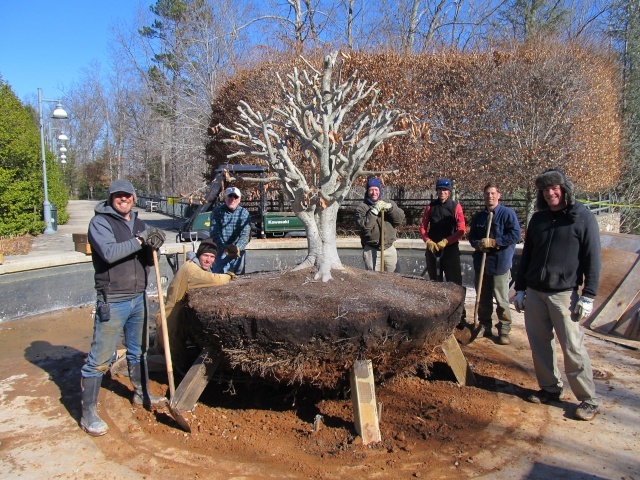 I was greatly saddened to see it removed from where it was, but I look forward to it one day being a fabulous signature piece in the NC Arboretum bonsai collection. 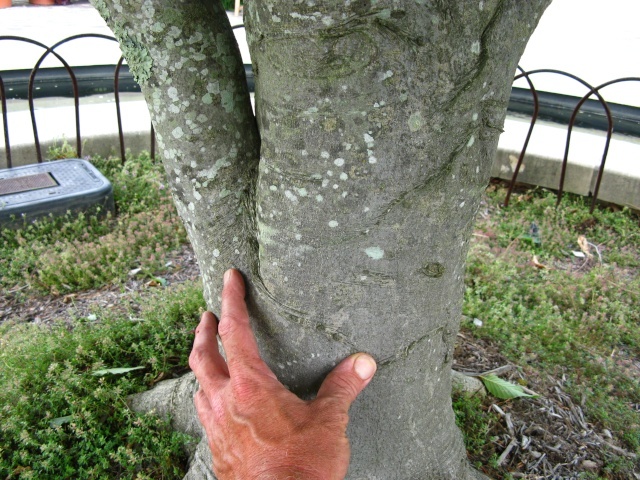 What follows is a pictorial account of the process of transplanting the tree, which survived and is doing well. I expect it will take between 2 to 4 years before it will be ready to show again. That is just simply excellent! One question. Did you happen to plant it over a tile? Mike - I did put a piece of 3/4" pressure-treated plywood under it, but I don't think even that was necessary. Where we put the beech is a site that used to be a mountain top, that had 40ft. or so taken off it 20-something years ago to make a level surface for a building. Just a very short distance below the surface is solid rock. 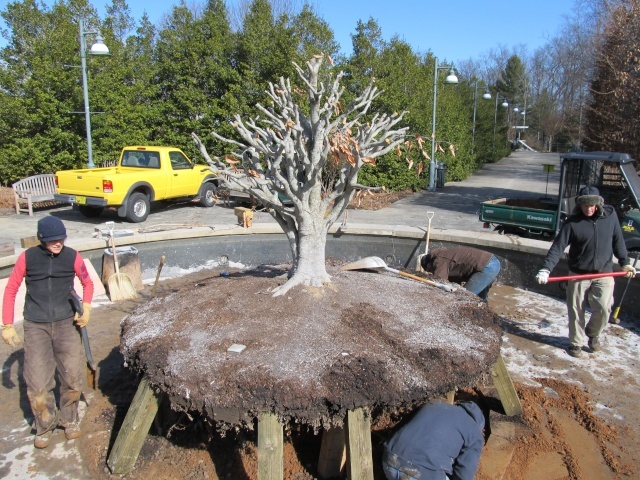 We know from other landscape plants planted on that site that roots, even tree roots, cannot go very far down. They grow laterally. We planted it in a sort of raised bed situation to make it easier to dig up again, but we will still need a crane to lift and carry it to where it will eventually be displayed. 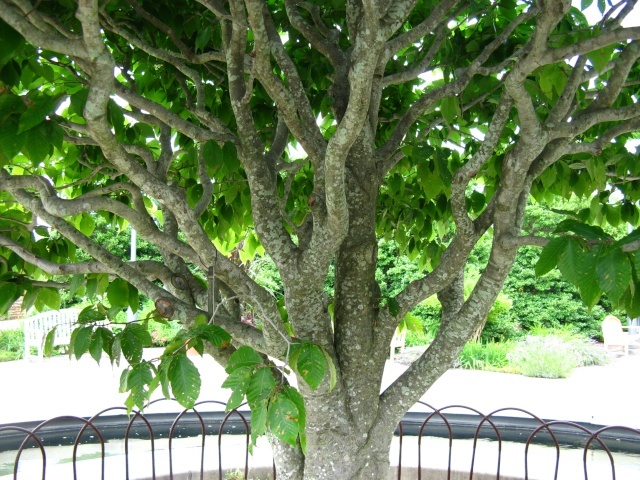 Alain - My intention is to work with a craftsperson to design a custom pot for the tree, probably made out of metal. Given the size and weight of the thing I want to not have to ever move it again. I hope we can come up with a system that allows for the walls of the container to be "breakaway" so that repotting can be done right where the tree eventually is placed. That's the plan, anyway! Arthur, I wonder whether you should raally plan for a METAL pot. It can warm up in summe and burn the roots . Good point, Uncle Walter! Perhaps some sort of coating on the metal to make it light in color and reflective of the sun? Walter Pall wrote: Great story. Great tree. Arthur, I wonder whether you should raeally plan for a METAL pot. It can warm up in summe and burn the roots . The break away pot idea is an excellent one. 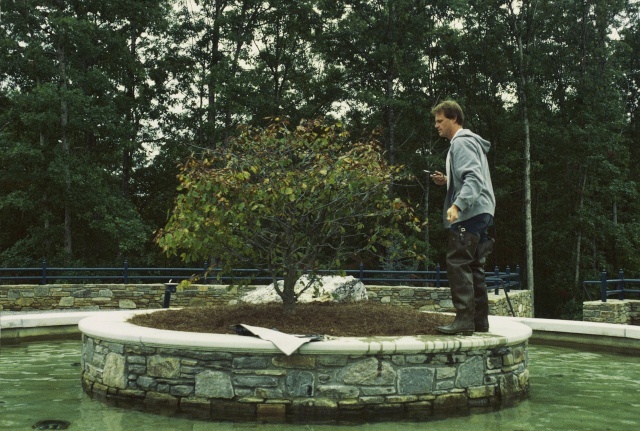 I've seen pictures of giant bonsai before. The bougainvillea in Australia with the pot that a dog and 2 children can sit in comes to mind. That pot is ceramic. The tree needs to be moved with a skid steer bobcat thing. Every time it needs to be repotted they have to lift it up. I would be concerned about breaking branches ot something slipping and tearing bark off. The idea of a breakdown pot for monster bonsai is brilliant! Arthur, I wonder whether you should really plan for a METAL pot. It can warm up in summer and burn the roots .